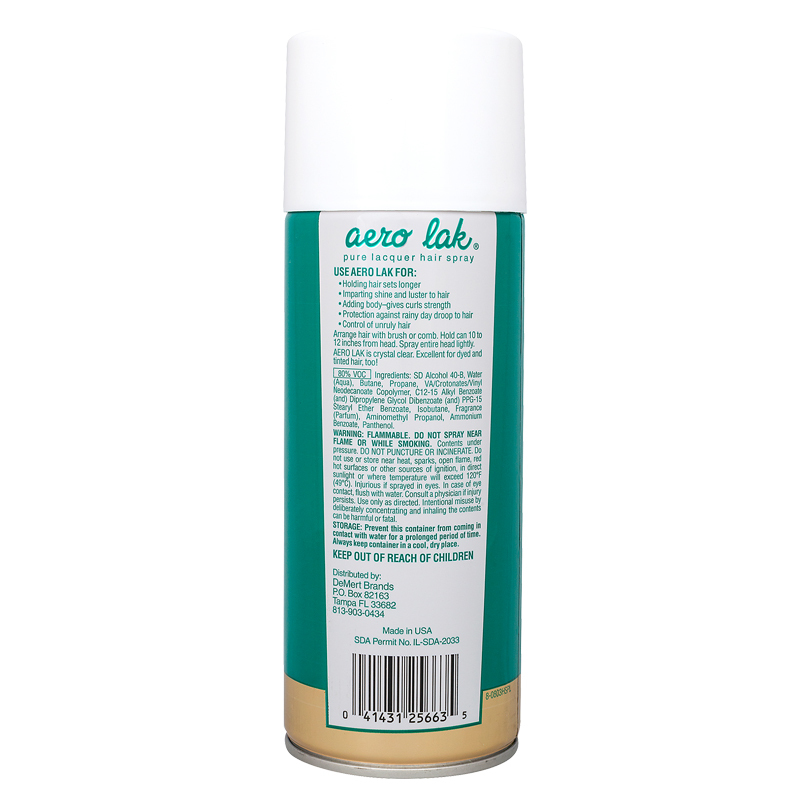 Use Aero Lak for: Holding hair sets longer, Imparting shine and luster to hair, Adding body- gives curls strength, Protection against rainy day droop to hair, Control of unruly hair. **Please Note: This item is restricted from being sold or shipped to certain states within the US due to VOC compliance. Those states include: California, Connecticut, Delaware, Illinois, Indiana, Maine, Maryland, Massachusetts, Michigan, New Hampshire, New Jersey, New York, Ohio, Pennsylvania, Rhode Island, Utah, Virginia, Vermont and Washington DC. Directions: Arrange hair with brush or comb. Hold can 10 to 12 inches from head. Spray entire head lightly. Aero Lak is crystal clear. Excellent for dyed and tinted hair, too! Warning: FLAMMABLE. DO NOT USE NEAR FIRE OR WHILE SMOKING. Contents under pressure. DO NOT PUNCTURE OR INCINERATE. Do not use or store near heat, sparks, open flame, red hot surfaces, or other sources of ignition, in direct sunlight, or temperature will exceed 120 F. Injurious if sprayed in eyes. In case of eye contact flush with water. Consult a physican if injury persists. Use only as directed. Intentional misuse by deliberately concentrating and inhaling the contents can be harmful or fatal.